AR Synth Music is a unique blend of performance music and augmented reality.To make it work all you need is a dollar. 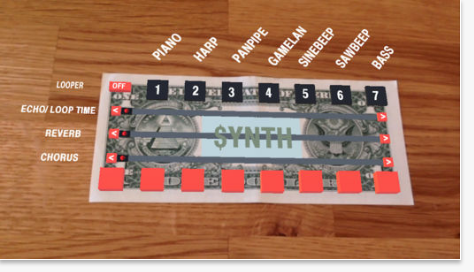 Simply look through your iPhone screen and the dollar transforms into a full potential synthesizer. Place your fingers over the orange virtual buttons to use them. The synth has seven sounds, three effect sliders, a looper, and a full octave of keys. The programmed sounds are: piano, harp, panpipe, gamelan, sinebeep, sawbeep, and bass. The effect sliders are echo/loop time, reverb and chorus. Play for your friends or an audience or just hook in your headphones and play for yourself. No one will believe you when you say that you can play music with a dollar bill let alone a synthesizer!